An incomparably powerful notebook, but at $3300 and 10+ pounds, it's stretching the limits of affordability and portability. There are laptops, and then there are desktop replacements, hulking beasts which you don’t want anywhere near your lap. DTRs tend to be bulky, heavy, and hot. But they also sport the fastest hardware available in a mobile form factor. That’s why gamers who are unwilling to compromise on performance don’t mind lugging them around. And no DTR puts performance first as well as MSI’s GT80 Titan SLI. This system’s specifications do all of the talking. Most notably, you get two GeForce GTX 980M graphics modules, each with 8GB of GDDR5 memory, running in SLI. That’s frankly overkill for the 18.4” panel and its 1920x1080 native resolution. However, if you’re really using the GT80 as a desktop replacement, two mini-DisplayPort connectors and an HDMI output give you some interesting options for attaching external monitors. We hooked up Asus’ PQ321 4K panel and recorded an average of 39.3 FPS in our taxing Metro: Last Light benchmark using the Very High detail preset. The same test runs at 91 FPS on the GT80’s FHD panel, so you just know those 980Ms are meant for higher resolutions. Of course, there’s nothing wrong with playing on that big 18.4” PLS screen either. It offers great viewing angles and a non-reflective surface to minimize glare. No matter what game you launch, regardless of the quality settings you select, there’s almost no way to bottleneck two 980Ms with 8GB each at 1920x1080. The Core i7-4720HQ processor isn’t Intel’s fastest mobile offering. For gaming, though, the quad-core model with Hyper-Threading and 6MB of shared L3 cache is more than ample. Under threaded loads, it runs at 2.6 GHz. Less taxing games leave thermal headroom on the table, and Turbo Boost technology exploits that to push frequencies up to 3.6GHz. We only lament that the -4720HQ is soldered to MSI’s HM87-based motherboard. Competing dual-GPU platforms like Sager’s NP9377-S use socketed CPUs, giving do-it-yourselfers the freedom to upgrade. MSI’s massive chassis does have plenty of room for expansion elsewhere, though. Only two of its memory slots are populated, so if you need more than the stock configuration’s 16GB of DDR3-1600, an additional pair of SO-DIMM slots is available. And although the GT80 Titan SLI-001 comes with two 128GB Kingston SSDs in RAID 0, along with a 1TB mechanical hard drive, two M.2 bays sit vacant, ready to accept extra solid-state storage. Best of all, MSI gives you access to its guts through a removable panel secured by a couple of screws. Getting to a notebook’s serviceable parts has never been easier. Check out this page for more benchmarks of the GT80 Titan compared to other gaming notebooks. MSI really went bold with its mechanical keyboard and trackpad. The core components are backed by a Blu-ray burner, 802.11ac Wi-Fi, Bluetooth, gigabit Ethernet, five USB 3.0 ports, a microphone input, and headphone output. MSI covers its bases and includes all of the capabilities we’d expect from a high-end desktop machine. Where MSI really went bold was with its keyboard and trackpad. Eschewing the chiclet-style keys found on so many mobile systems, MSI implements a red-backlit SteelSeries mechanical keyboard with Cherry MX Brown switches. It takes some getting used to, but the light actuation force is ideal for fast-paced action. And they sound so satisfying clicking away. With so much of the GT80’s body consumed by access panels, the keyboard is necessarily placed near the edge of the chassis, where your palms would normally sit. This leaves no room for a conventional trackpad. MSI instead implements a combination trackpad/keypad to the far-right. Pressing the built-in Num Lock contact switches between both modes. The assumption is, of course, that you’re going to use the GT80 with a mouse, diminishing the reason for a trackpad sitting front-and-center. We concur; MSI’s solution works well when a mouse isn’t readily available, but a DTR like this one deserves to be used with real gaming gear. One side-effect of the keyboard’s placement is that typing becomes awkward as your fingers reach up and over the large keys. 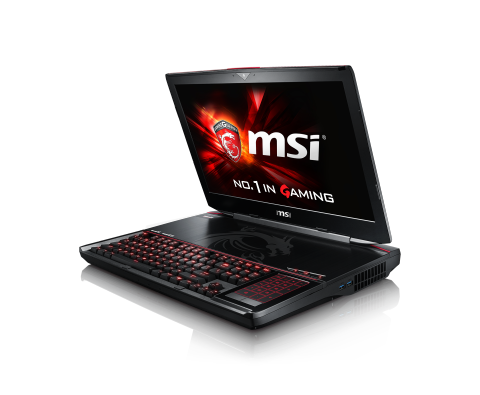 Dig through MSI’s bundle, though, and you’ll find a soft palm rest that butts right up to the laptop’s bottom edge. It’s a very necessary part of the kit, and it’s hard to tell how long the gel-like surface will last. But at least for now, the palm rest is oh-so-comfortable. Also included is a backpack for hauling the system around; gold-painted caps for the W, A, S, and D keys; a keychain; and a mouse pad. For a platform this deluxe, MSI really should consider tossing in one of its gaming mice, too. The GT80 Titan has a great build quality. It sports a black brushed aluminum lid with red highlights that match the keyboard’s lighting. A thickness measurement of almost two inches creates plenty of room for exhaust vents on the sides and back. Air is pulled in from the bottom of the chassis, so you’ll probably want to use the GT80 on a table where its small rubber feet provide just enough elevation for suitable flow. Even if that wasn’t the case, our sample is nearly 18” wide and weighs in over 10 pounds—it’s just not intended for a life of use on your legs. Scrutinizing battery life might seem pedantic when discussing a notebook that needs a 330W power adapter. However, MSI does arm its GT80 Titan with an eight-cell 5225 mAh pack capable of keeping the platform running for more than an hour while you game. Here’s the thing, though—3D performance away from the wall is worse than one GeForce GTX 980M on its own, much less two. MSI knows about this and says it’s deliberate, since most gamers won’t want to burn through limited power reserves on the road. We don’t disagree, but still prefer a choice in the matter. We’re not particularly bullish on the Dynaudio premium speakers either, which deliver surprisingly narrow frequency response given the size of the enclosure MSI had to work with. Also, we’d love to see the company discontinue use of Norton’s security software, which starts hitting you with nagging pop-ups alongside MSI’s own bundled apps. Those few complaints aside, the GT80 Titan SLI-001 is a purpose-built powerhouse. Its graphics hardware easily drives the 18.4” PLS panel at 1920x1080 using the top settings in any game you choose, almost begging for a 4K screen or three panels in Surround. You’ll either love or hate the SteelSeries mechanical keyboard. We began our review apprehensive, but quickly learned to love the clicky key presses in the notebook chassis. A high degree of storage and memory upgradability is tempered only by the soldered-down CPU, which cannot be swapped out. Knowing that the GT80 Titan SLI-001 isn’t meant for gaming away from a wall socket, the real question is how much better you could do for the money with a small form-factor desktop rig. There’s definitely a lot to like here; we’re just not sure it all adds up to $3300. At least there’s a two-year limited warranty covering your investment, should you choose to give the GT80 a chance.